Up to 2,000 people have taken part in a procession to mark the reopening of an east London Sikh temple that was destroyed in a suspected arson attack. 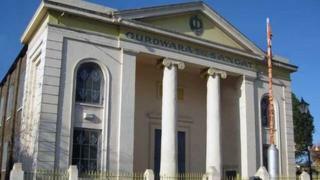 About £1.4m has been spent rebuilding the Grade II-listed Gurdwara Sikh Sangat in Harley Grove, Bow, that was burnt down in March 2009. Members of the Sikh community walked from the temple through Mile End, Stepney Green and Bethnal Green. Worshipers handed out food to local people along the route on Sunday. Ceremonies and festivities were then held inside the rebuilt Gurdwara. Jagmohan Singh, spokesman for Gurdwara Sikh Sangat, said: "Naturally, because it's a religious procession it's been very peaceful, very colourful and noisy too." The fire in 2009 destroyed 75% of the building, several Sikh holy books and caused the roof to collapse. The temple continued to function from some rooms at the back of the building, which were restored at a cost of £200,000. A £50,000 reward was offered to help catch the arsonist but no arrests have been made.